The Golf Swing – Form or Function? Home › Newsletter › Golf Swing Weight Shift – Yes or No? Golf Swing Weight Shift – Yes or No? There are two schools of thought when it comes to the golf swing weight shift. You either shift your weight during your golf swing or you leave it on the target side leg. I know golfers who are successful with both. So in many cases it is a matter of choice. Lately, there is a new factor that may change your mind. It’s called Ground Reaction Force, also called GRF. What is GRF? In accordance with Newton’s laws, every action has an equal and opposite reaction. Just like it sounds, if you push into the ground, the ground pushes back! And that seemingly imperceptible push back can add power to your golf swing if you time it correctly. I discovered how GRF works during the golf swing by accident. Literally, I twisted my ankle while running! The result was a very painful high sprain and over eight months of recovery. That was the accident that led to my discovering this phenomenon for myself. I stumbled on this wonderful force because some of my golf students wanted me to play golf with them despite my injury. They believed I could find a way to hit a golf shot without using my left ankle, so I couldn’t let them down. After about 30 minutes, I found a way to make a golf swing that not only prevented my occasional hook (my nemesis), but it also added 20 yards to my drives. I didn’t understand it, but I liked it. The difference was my golf swing weight shift. I have always made the traditional backswing on my right side and shifted to the left foot for the downswing. The issue I have always fought with that weight shift is head movement and an occasional slide(during the shift) that would cause the hooks. Why did I stick with it? Did you see how much I weigh? At 160 pounds, I need everything I can put into the ball for distance, or so I thought. How did the new weight shift change things? Well, instead of shifting weight to the left foot, I turned my core toward the ball and only moved my weight slightly, with the idea of keeping the weight behind the golf ball so as to save my ankle. So during the transition instead of moving my weight toward the target, I pushed it down into the ground. At the same time, the power stored during my backswing was releasing to uncoil my right side for the downswing. As I pushed into the ground, the Ground Reaction Force pushed back, effectively compressing the imaginary spring I had coiled during the backswing. It sounds far-fetched but the result is that I had more power behind the ball. In addition, my weight moved toward my left foot AS the club moved through impact. So instead of having a large part of my weight already on my left foot during impact, I had the majority of it adding to the power of impact. This new weight shift is part of the modified pre-set swing drill you can download when you subscribe to the Breaking Golf’s Last Barrier newsletter. So, back to the original question… To shift or not to shift? The difference I see now between staying left and my modified weight shift is that staying left doesn’t take advantage of GRF. I have students who hit the ball a country mile staying left and I would never suggest that they change, but if you need some distance, it might be worth looking into. Also, if you use a traditional weight shift and you fight “getting stuck” or your snarf shot is a nasty hook, this weight shift could be the cure. always look forward to your emails. have been a fan since i purchased your original materials a long time ago. sounds very interesting since I have a problem with my left hip I suffer from the quick snaps.I am excited to see the new book -have been a big follower and teacher of dynamic balance. I will try this, but just afraid that it will hurt my timing. Also, does this affect the follow through. It seems to help the follow through to prevent a “wipe” across the ball. Very interesting article. Can’t wait for more. Interesting, I was just thinking about weight shift at range today. I will try this tomorrow. I have a weak left ankle due to fused bones so I hope this helps. The “GRF” seems to me like the old Sam Snead “squat”‘ ? Almost, the exception would be that in this newer shift, you keep the weight behind the ball. Get a free book chapter and updates on the publishing date! A Bulletproof golf swing in only 30 min/week practice? Tracy Reed is a Golf Finishing Coach specializing in helping you bridge the gap between your current golf game and the golf game you dream of playing by filling in the crucial missing piece that just can't be found in golf instruction. 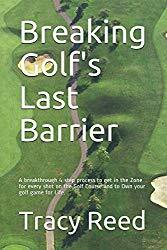 Breaking Golf's Last Barrier shows you how the Active Awareness process will make your golf swing bulletproof, eliminate those frustrating nightmare shots that ruin your best rounds and make golf enjoyable again with as little as 30 min/week practice... At home! Tracy condenses 30 years of research combined with experience teaching over 10,000 golfers in 51 countries around the world to simplify the game of golf both physically and mentally so you can enjoy the game of golf and handle any issues when your golf game begins to stray off course. Learn why awareness of balance is the first and most important element of your golf game you should address. Learn the difference between static and dynamic balance and how your own body's balance system could be the sneaky culprit that's been wrecking your golf game for years. Learn the one routine that fixes 90% of swing faults, including tempo. Learn a much simpler method to shape shots so that you don't turn a draw into a snap hook, or a fade into a slice.